West Papua is the western half of the island of New Guinea. It borders independent Papua New Guinea and became part of Indonesia following a discredited process known as the ‘Act of Free Choice’ in 1969. West Papua’s population of 3.6 million consisted of 48.7% indigenous Papuans and 51.3% non-Papuans according to the 2010 census, and includes over 250 ethnic and language groups. Migrants from other parts of Indonesia make up a substantial proportion of the population and dominate the local economy. They are already a majority in urban centres and will soon outnumber indigenous Papuans overall. Papuan livelihoods and cultures are under severe threat from this process of marginalisation. Papuan people are Melanesians and the majority are Christian, as distinct from their primarily Malay, Muslim neighbours in Indonesia. The territory was previously known as West New Guinea, West Irian and Irian Jaya. 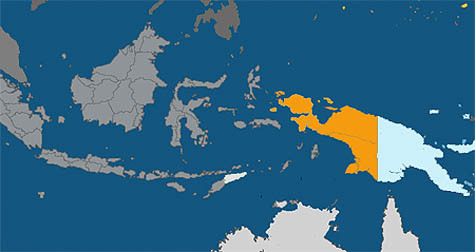 It now comprises the Indonesian provinces of Papua and West Papua. Both provinces are together commonly known as West Papua because of their shared identity and culture. Like the rest of present-day Indonesia, West Papua was formerly part of the Dutch East Indies, but remained under Dutch rule after Indonesia gained its independence in 1949. At the beginning of the 1960s, it was being prepared for independence by the Dutch in the face of strong opposition and military incursions from Indonesia. In February 1961, elections took place for a West New Guinea Council, an important step on the road to self-government. Members of the Council organised the First Papuan Peoples’ Congress that, on 19 October 1961, agreed an Independence Manifesto. It adopted the Morning Star (Bintang Kejora) flag as the national symbol, and agreed the name of the country (West Papua), the name of the people (the Papuan people) and a national anthem. On 1 December 1961, these symbols of West Papuan sovereignty were inaugurated in the presence of Dutch officials. The Papuans have since celebrated 1 December as their independence day. However, in the context of Cold War geopolitics, the United States was anxious to prevent Indonesia falling under Communist influence. On 15 August 1961, it persuaded the Dutch to enter into the ‘New York Agreement’ with Indonesia concerning the future of West Papua. No Papuans were consulted, but the Agreement stipulated that all adult Papuans would have the right to participate in an act of self determination in accordance with international practice. The Dutch then handed West Papua over to a temporary UN authority, which stayed only seven months before handing control to Indonesia in May 1963. Thereafter, the UN failed to respond to Indonesia’s policy of repression or to protect Papuan rights, which were guaranteed by the New York Agreement. In 1969, a hand-picked group of 1,025 Papuans, out of a population of around 800,000, were threatened and intimidated into voting for their country to become part of Indonesia in a process known as the Act of Free Choice. The UN controversially stood by and allowed this to happen without objection. After the international community diverted its attention from West Papua in 1969, a veil of secrecy fell over the territory and little news emerged about the widespread violation of human rights – including extra-judicial killings, torture, disappearances, and arbitrary arrests and detentions – perpetrated by Indonesian security forces. Many thousands of people are thought to have been killed or died as a consequence of Indonesian rule. The systematic exploitation of West Papua’s abundant natural resources and large-scale land-grabs for agribusiness projects by Indonesian and international business interests have been a major cause of tension and conflict. Extractive operations have involved the denial of land rights and severe environmental degradation. Large areas of forest are being targeted for use for palm oil plantations and food production with major implications for climate change and the indigenous population. Some of the worst human rights violations have been committed in the vicinity of major enterprises, such as the Freeport copper-and-gold mine, which are given corporate-funded ‘protection’ by the security forces. Following the downfall of Indonesia’s autocratic dictator, Suharto, in May 1998, the Papuan people experienced a period of relative openness under the brief presidencies of Bacharuddin Jusuf Habibie (1998-1999) and Abdurrahman Wahid (1999-2001). President Wahid allowed the Second Peoples’ Congress to take place in May/June 2000. The Congress resolved to reject the Act of Free Choice and push for the right to self-determination peacefully through dialogue and negotiation. However, while Indonesia has since made substantial progress in its transition to democracy, the Papuan people have not benefited. Special autonomy, introduced in 2001, has been rejected by West Papua’s indigenous assembly and community representatives for failing to improve the rights and living conditions of the Papuan people. Further efforts are now being made by West Papua’s indigenous and religious leaders to establish a process of dialogue with the Indonesian Government. However, not all Papuans support the process because of their lack of trust in the Indonesian Government; some believe that a more direct approach, involving a referendum on the territory’s future political status, is what is required. In July 2011, a Peace Conference organised by the Papua Peace Network provided a framework for dialogue with the Indonesian Government and an aspirational agenda for a peaceful Papua with a series of ‘Indicators of Papua, Land of Peace’ in the fields of politics, law and human rights, economics and environment, and security. Despite these persistent calls for political dialogue, the security approach continues to be the Government’s dominant means of dealing with the West Papua problem. Military operations and a heavy-handed approach to security pose a serious threat to the human rights and lives of the Papuan people. A culture of violence has developed which is linked to the belief held by the security forces that political activity and advocacy for Papuan rights is associated with a separatist agenda and should be met with a harsh response. In October 2011, three people were killed during the violent dispersal by the security forces of the Third Papuan Peoples’ Congress held in the regional capital, Jayapura. The Congress was called by indigenous Papuan leaders together with various political factions to discuss their basic rights and ended with a declaration that West Papua had been independent since 1961. Five Papuan leaders were brought to trial and found guilty of treason. 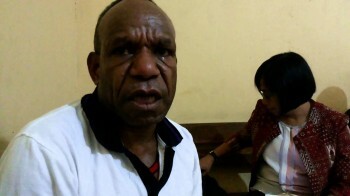 While Papuans are often severely punished for peaceful political activities, by contrast security forces personnel involved in egregious violations of human rights routinely escape punishment or are given derisory sentences. In January 2011, three soldiers were sentenced to between eight and ten months imprisonment for the procedural offence of ‘disobeying orders’ for their involvement in the brutal torture of two Papuan men in May 2010. Papuan activists are regularly arrested and detained for peaceful actions, such as raising the Morning Star flag or attending demonstrations and public events that are associated with Papuan nationalism. They are frequently charged with treason (makar) under Article 106 of the Criminal Code, introduced into Indonesian law by the Dutch colonial administration. If convicted, they face prison sentences of up to twenty years or life. Many complaints have been made about the torture and ill-treatment of political prisoners and their lack of access to adequate medical treatment. These restrictions on the right to freedom of expression and the criminalisation of peaceful political activities in this way are fundamental issues of concern in West Papua. Freedom of expression is strategically important to improving the overall human rights environment and to ensuring that human rights defenders can carry out their vital work free from intimidation and violence. It is also required in order to create the conditions in which the political problems of the territory can be resolved. The closing down of democratic space, which results from restrictions on freedom of expression, is a move away from the conditions that could support meaningful dialogue and the resolution of the conflict. Papuans Behind Bars seeks to address this by promoting debate and changes in practice and policy that will lead to an opening up of democratic space in the territory.